Throughout South Africa the word ‘Dagga’ crops up in place names and locations. There are a number of farms called ‘Dagga Kraal’ and ‘Dagga Fontein’ but their names are shrouded in a sketchy etymological history and theories abound as to why the word Dagga made it’s way into describing these places. One of the oldest records of the word being used in a farm name is in the Eastern Cape at what is now known as Dagga Boer’s Nek, the well known mountain pass South of Craddock on the N10. Records of Dagga Boer Farm abound in 1820 Settler history, but none of these records confirm the reasons why the farm employed the word Dagga. However, there are a number of theories that we can explore. The most obvious theory is the farm could well have been used to grow Dagga. We know some white settlers grew the plant dacha, dakka, dacca, to entice Hottentot natives to stay in the area as labourers and to trade for ivory, skins and cattle. Dagga was used as an incentive or even as a payment for labour, just as the Cape Vinyards do to this day with their (now illegal) dop system of payment for labour with wine products. If this were the case, it is surprising there aren’t many more farms with Dagga in the name. By the time the 1820 settlers arrived from Europe, Dagga had been in Southern Africa 400 years. 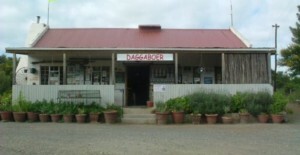 In this case Daggaboersnek Farm came about in 1752 after being renamed from ‘Knapzakfontein‘. It is difficult to find our why. Another plausible theory is wrapped around linguistics. Some say it was derived from an early 19th century incident when a company of Boers trekking inland were surprised by a large band of Hottentots on the Nek (pass). They appeared friendly and kept on greeting the Boers with ‘Dag-ga-boer, Dag-ga-boer” (‘Good Day Farmer’). The Boers in this instance were subsequently surrounded and murdered. Colony. This was considered a dangerous undertaking and the natives went with them as far as the neck of land commanding a fine view of rolling open country. 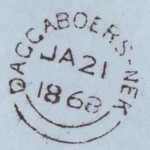 Daggaboers Nek. The place came to be known as the place of greeting. Either way, DaggaBoers Nek is steeped in colonial history and marks the place the 8th Frontier (Kaffir) war took place. The 8th Frontier war (or war of Mlangeni) was the longest and costliest of the nearly 100 years of British colonial expansion conflict. In the hills and kloofs around Daggaboers Nek the British were eventually defeated and the Xhosa were victorious. A turning point in South African history. It is easy to imagine, after three years of bloody conflict, a victorious Xhosa nation may have celebrated by looking out over their ancestral Eastern Cape lands from the top of Daggaboers Nek and passed around a few bone pipes and gourd pipes full of celebratory greenery. One thing we know, the Eastern Cape is still one of the world’s most prolific dagga growing areas and has been for hundreds of years. Daggaboers Nek is a fitting name for the picturesque mountain drive that takes the traveler from the Eastern seaboard into the mighty Karoo interior and a great route to enjoy a sunrise spliff on an epic South African road trip……..
Hi there where do I sign the petition. Thank you for informing people there are many herbs out there that can help us. Lets do away with prescription drugs and declare the illegal. Can I have your e mail adress. Guys how about making paper petitions so that we can take these struggle further there are lot of people in the ghettos who will be happy to support you guys so think about that as you had said let it be the dagga year so publish those form and lets see how far can we go but I promise you on papers we will make it course those people on the ghetto have being saling long time ago so these will be their ticket to freedom.Thanks for your time. This is a great place to visit. When asking the locals about the name, they mentioned that Dagga was grown in the area for the horses to eat, to calm them down in the face of gunfire and the mayhem that was prevalent in the day. They also said that it gave them greater tenacity against fatigue. How true this is I cannot say, but it seems plausible. Thanks for your comment James. It only adds to the richness of the story, and to us, is perfectly plausible.